"Hunter Killer" is having its home entertainment release on January 29, 2019, with digital out now. The action film will be on 4K Ultra HD™ Combo Pack (plus Blu-ray and Digital), Blu-ray™ Combo Pack (plus DVD and Digital), DVD and On Demand. 1 - copy of "HUNTER KILLER"
To enter you must be subscribed to my YouTube channel: Thisfunktional and follow instagram.com/Thisfunktional and email me your full name and mailing address with the subject line #ThisfunktionalContest #HunterKiller to Thisfunktional@Gmail.com. Disclaimer: Winners will be chosen randomly. Contest runs to January 31 2019 at noon. No purchase necessary. Prize provided by MPRM Communications. Only open to the U.S., no PO Boxes or international addresses. Only one entry per household. Entries on behalf of another person will not be accepted and joint submissions are not allowed. We will not accept entries of contestants who have claimed a prize in the last 6 months. Experience the year’s most intense action-thriller when "Hunter Killer" arrives on Digital January 15, 2019 and on 4K Ultra HD™ Combo Pack (plus Blu-ray and Digital), Blu-ray™ Combo Pack (plus DVD and Digital), DVD and On Demand January 29, 2019 from Summit Premiere, a Lionsgate company. From the producers of The Fast and the Furious and Olympus Has Fallen, the film is a high-stakes action-thriller, taking audiences deep beneath the Arctic Ocean to sneak through enemy waters and stop WWIII from becoming a reality. "Hunter Killer" features an all-star cast including Gerard Butler (Olympus Has Fallen, 300, The Bounty Hunter), Oscar® winner Gary Oldman (2017, Best Actor,Darkest Hour), Oscar® winner Common (2014, Best Original Song, Selma), Primetime Emmy® nominee Linda Cardellini (2013, Best Guest Actress in a Drama Series, “Mad Men”) and Toby Stephens (Die Another Day, The Machine, 13 Hours). Deep under the Arctic Ocean, American submarine Captain Joe Glass (Butler) is on the hunt for a U.S. sub in distress when he uncovers a secret Russian coup threatening to dismantle the world order. With crew and country on the line, Captain Glass must now assemble an elite group of Navy SEALs to rescue the kidnapped Russian president and sneak through enemy waters to stop WWIII. Take home Hunter Killer and take a deep dive into the making of the film with the “Surface Tension: Declassifying Hunter Killer” two-part featurette, as well as an audio commentary with director Donovan Marsh. The 4K Ultra HD Combo Pack and Blu-ray also feature Dolby Atmos® audio mixed specifically for the home, to place and move audio anywhere in the room, including overhead. 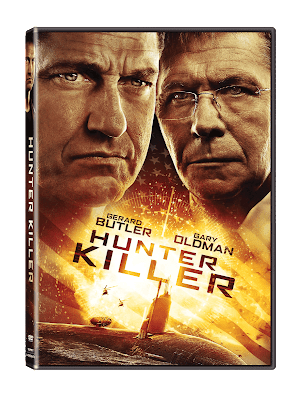 The "Hunter Killer" 4K Ultra HD Combo Pack, Blu-ray Combo Pack, and DVD will be available for the suggested retail price of $42.99, $39.99, and $29.95, respectively.